WASHINGTON (AP) — The United States announced Friday that it is pulling out of a landmark nuclear arms treaty with Russia, arguing that it should not be constrained by a deal Moscow is violating with “impunity” by deploying banned missiles. Democrats in Congress and some arms control advocates slammed the decision as opening the door to an arms race. President Donald Trump repeated a yearslong U.S. accusation that Russia secretly developed and deployed “a prohibited missile system that poses a direct threat to our allies and troops abroad.” He said the U.S. had adhered to the Intermediate-Range Nuclear Forces treaty since it was signed in 1987, but Russia had not. “We cannot be the only country in the world unilaterally bound by this treaty, or any other,” Trump said in a written statement. The Trump decision reflects his administration’s view that the arms treaty was an unacceptable obstacle to more forcefully confronting not only Russia but also China. China’s military has grown mightily since the treaty was signed, and the pact has prevented the U.S. from deploying weapons to counter those being developed in Beijing. Pulling the plug on the INF pact, however, risks aggravating relations with European allies, who share the administration’s view that Russia is violating the treaty but who have not endorsed a U.S. withdrawal. 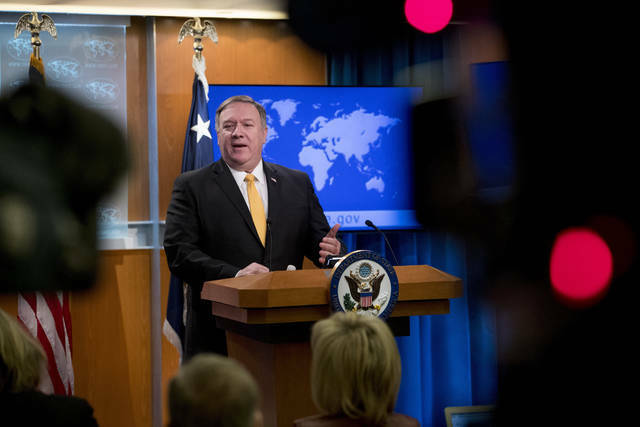 Secretary of State Mike Pompeo, speaking to reporters after Trump’s statement, said Russia will be formally notified on Saturday that the U.S. is withdrawing from the treaty, effective in six months. In the meantime, starting Saturday, the U.S. will suspend its obligations under the treaty. 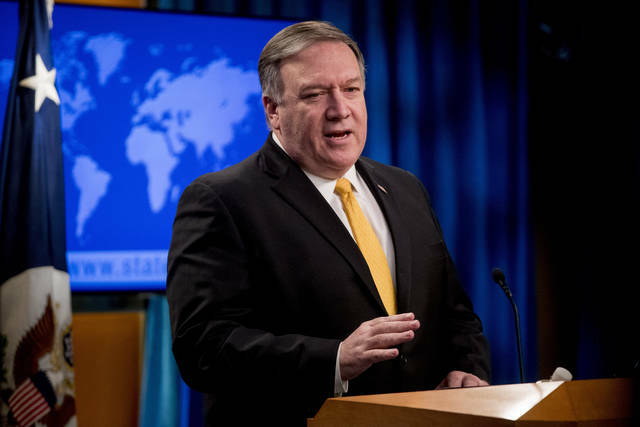 Pompeo said that if, in the coming six months, Russia accepts U.S. demands that it verifiably destroy the cruise missiles that Washington claims are a violation, then the treaty can be saved. If it does not, “the treaty terminates,” he said. Administration officials have dismissed concerns that the treaty’s demise could trigger a race to develop and deploy more intermediate-range missiles. U.S. officials have emphasized their fear that China, which is not party to the treaty, is gaining a significant military advantage in Asia by deploying large numbers of missiles with ranges beyond the treaty’s limit. Whether the U.S. will now respond by deploying INF noncompliant missiles in Asia is unclear. In any case, it seems unlikely Beijing would agree to any negotiated limits on its weaponry. “I ‘congratulate’ the whole world; the United States has taken another step toward its destruction today,” Konstantin Kosachev, head of the foreign affairs committee in Russia’s upper house of parliament, said after Trump’s announcement. Trump said his administration “will move forward with developing our own military response options.” But senior Trump administration officials said Friday that they don’t expect any immediate testing or deployment of weapons that are banned under the treaty. The current Pentagon budget includes $48 million for research on potential military responses to the alleged Russian violations, but U.S. officials said the options do not include a nuclear missile. The officials, speaking after Trump’s announcement, said the U.S. is not in position to flight test, let alone deploy, INF noncompliant missiles as a counter to Russia any time soon. The officials spoke on condition of anonymity under ground rules set by the White House. Leaving the treaty would allow the Trump administration to counter the Chinese, but it’s unclear how it would do that. U.S. security concerns are complicated by what U.S. intelligence officials earlier this week called efforts by China and Russia to expand their global influence, particularly in Asia and the Middle East. “China and Russia are more aligned than at any point since the mid-1950s, and the relationship is likely to strengthen in the coming years as some of their interests and threat perceptions converge,” Director of National Intelligence Dan Coats said in testimony Tuesday to Congress. Nuclear weapons experts at the Carnegie Endowment for International Peace say U.S. withdrawal under current circumstances is counterproductive, even though Russia’s violations are a serious problem. “Leaving the INF treaty will unleash a new missile competition between the United States and Russia,” they said in a statement. MOSCOW (AP) — Russian politicians on Friday blamed the United States for undermining global security by ending compliance with a nuclear arms treaty, while European countries watched with dismay and NATO said Russia was at fault for the pact’s demise. The Intermediate-Range Nuclear Forces treaty had been a cornerstone of international security since the United States and the Soviet Union signed it in 1987. The treaty bans the development, deployment and testing of land-based nuclear weapons with a range of 500 to 5,500 kilometers (310-3400 miles). The U.S. announcement that it would stop observing the treaty as of Saturday and would withdraw from it within six months came after years of dispute between Moscow and Washington, each claiming the other was in violation. In particular, the United States said a new Russian missile breached the treaty. But Russia accused the United States of unilaterally seeking to neuter the treaty and of resisting Russian attempts to resolve the dispute. “I ‘congratulate’ the whole world; the United States has taken another step toward its destruction today,” Konstantin Kosachev, head of the foreign affairs committee in the upper house of parliament, said after the announcement. “This step carries a threat to the entire system of international security, but first of all for Russia because after leaving the INF the Americans will deploy these missiles in European countries,” said another senator, Igor Morozov. But the end of the treaty could also serve Russia’s strategic interests, removing any obstacle to deploying intermediate-range missiles that could reach Europe and China. 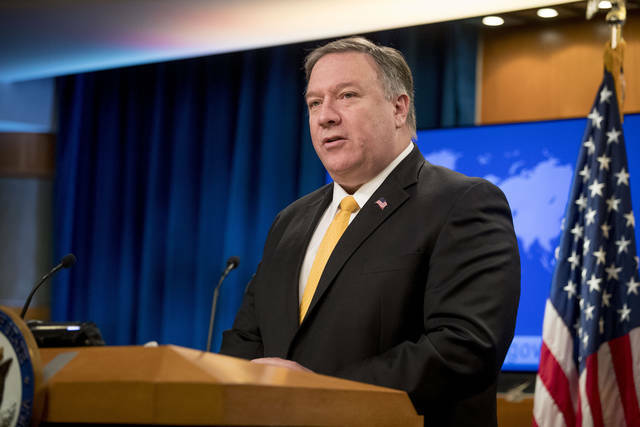 U.S. officials had expressed worry that China, which is not party to the treaty, is gaining a significant military advantage in Asia by deploying large numbers of missiles with ranges beyond the treaty’s limit. Leaving the INF treaty would allow the United States to counter the Chinese, but it’s unclear how it would do that. The U.S. move was regarded with anxiety in Europe. Before the withdrawal announcement, European Union foreign policy chief Federica Mogherini called on both sides to stick to the treaty. “What we definitely don’t want to see is our continent going back to being a battlefield or a place where other super-powers confront themselves. This belongs to a faraway history,” Mogherini told reporters in Romania. The Europeans are keen to avoid a repeat of the missile crisis in the 1980s. NATO allies decided to deploy U.S. cruise and Pershing 2 ballistic missiles in Europe in 1983 as negotiations with Moscow faltered over its stationing of SS-20 missiles in Eastern Europe. Ministers from the Baltic countries that border Russia — Lithuania, Latvia and Estonia — were mostly in support of the U.S. move and blame Russia. But Dutch Foreign Minister Stef Blok said Russia still has time to return to compliance. “It is up to Russia to show if they still want to meet the conditions. There is a six-month notice period so there is still time to meet the conditions and that is what we should be banking on,” Blok said. Alison Mutler in Bucharest, Lorne Cook and Raf Casert in Brussels and David Rising in Berlin contributed. WASHINGTON (AP) — Two years into Donald Trump’s presidency, his allies in Congress are quietly trying to influence and even reshape his “America First” foreign policy agenda. The Republican-led Senate is reasserting itself as a check on Trump’s instincts, while individual GOP lawmakers are seeking sway — defense hawks vying with non-interventionists — over policy in the Middle East, Latin America and beyond. Within one recent week, Florida Sen. Marco Rubio led a group of lawmakers to the White House encouraging Trump to back Venezuelan opposition leader Juan Guaido as the interim president. Trump tweeted his support. Days earlier, Kentucky Sen. Rand Paul was at the White House reinforcing Trump’s plan to withdraw U.S. troops from Syria and Afghanistan. The result can often seem like a foreign policy in flux, zigzagging from bold pronouncements to more measured actions as “a number of different voices on the Hill are trying to put their imprint on the policy,” said Brian Katulis, a former Clinton administration national security adviser now at the Center for American Progress. Setting the tone in the Senate, the first bill of the new year reaffirms sanctions on Syrian officials involved in war crimes and soon will include an amendment taking the unusual step of signaling opposition to Trump’s plan to withdraw troops from Syria and Afghanistan. Pushed forward by Senate Majority Leader Mitch McConnell of Kentucky, the legislation also is driving a political wedge dividing Democrats, particularly those running for president in 2020, over the troop withdrawal and a separate provision supporting Israel. “It is important that the Senate be on the right side of this issue so that we can hope to influence future actions and policies before they are taken, and we can help change them once they have been taken in places headed in the wrong direction,” Rubio said. Next up, McConnell is promising a debate on the importance of NATO, as Trump re-evaluates the U.S.’s long-standing commitment to its allies in Europe. “NATO deserves the Senate’s support,” McConnell said. Danielle Pletka, a senior vice president at the conservative American Enterprise Institute, said lawmakers are doing exactly what they should — asserting themselves as a separate but equal branch of government that has been largely dormant on foreign policy. Trump rode a populist wave to the White House with an “America First” approach focused on rebuilding the United States and bringing U.S. troops home, rather than funding wars overseas. It’s an instinct that fits more neatly into Paul’s noninterventionist wing, which rose to prominence with the tea party, rather than the worldview of traditional foreign policy conservatives such as McConnell, Rubio and Sen. Lindsey Graham of South Carolina. Gaveling that divide is the new chairman of the Senate Foreign Relations Committee, GOP Sen. Jim Risch of Idaho, who took over from outspoken Trump critic Bob Corker of Tennessee, who retired. Risch said “don’t read too much into” the first vote of the new Congress, saying lawmakers aren’t necessarily sending any message or asserting themselves any more than usual. Unlike the first years of the administration, when Republicans tested how publicly to oppose the president, often with mixed results, senators now seem to prefer softer diplomacy and private meetings to shape his policies. Paul said after meeting with Trump in mid-January that no other president in recent history has taken steps as bold as Trump to disentangle the United States from wars. A week later, Rubio and a group of lawmakers from Florida were at the White House urging Trump to support the opposition leader in Venezuela over embattled President Nicholas Maduro. Trump tweeted his support the next day for the South American nation’s opposition leader. As Trump develops his plan to withdraw troops from Syria and now Afghanistan, the conversations continue. McConnell talks with the president often. Traditional GOP hawks, including Sens. Tom Cotton of Arkansas and Joni Ernst of Iowa, were among a group of House and Senate Republicans who met with Trump at the White House shortly after he announced his decision for the Syria withdrawal. U.S. Immigration and Customs Enforcement has confirmed there are now nine men — up from six earlier this week — being force-fed under court order in a detention center in El Paso. One of the hunger strikers, a 22-year-old man from India who called The Associated Press on Friday, described being dragged from his cell three times a day and strapped down on a bed. He said a group of people force-feed him by pouring liquid into tubes pushed through his nose. Speaking through an interpreter, Singh said he has lost 50 pounds (23 kilograms) since he began his hunger strike. He said he is refusing food to protest guards’ unfair treatment of him and other detainees from Punjab. He said they are being denied bond while detainees from other countries were allowed out. Hunger strikes among immigrant detainees are uncommon, and court orders authorizing force-feeding are rare, said an ICE official, noting that once force-feeding is approved, detainees have in the past given up their hunger strikes. The official spoke anonymously because the official had not been authorized to speak publicly about the matter.